Passing the Gantocks outward bound on a chilly, damp July afternoon in 2004, the former Royal Caribbean Cruise Line ship SUNDREAM was, by that time, operating for Airtours under the My Travel name. She had been built in 1970 by Wartsila at their Helsinki shipyard, the first ship for the new Royal Caribbean company. 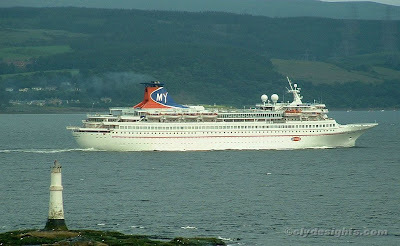 Lengthened in 1978, she was sold to Sun Cruises (part of Airtours) in 1996 at which time the distinctive 'sky lounge' - later to become a trademark of RCCL ships - was removed, improving her appearance. She continued to sail for My Travel until September 2004, after which she was renamed DREAM PRINCESS and was sold to an Israeli company. She had a spell acting as an accommodation ship following the devastation at New Orleans in the aftermath of Hurricane Katrina, losing the 'Princess' part of her name at that time. Since then she has had a somewhat chequered career, most rceently having been seen at a Bulgarian shipyard undergoing a transformation from her last role as the 'PEACEBOAT'. At 22,945 gross tons, FESTIVAL - as she is currently named - was 194.3 metres in length and could carry just over 700 passengers.